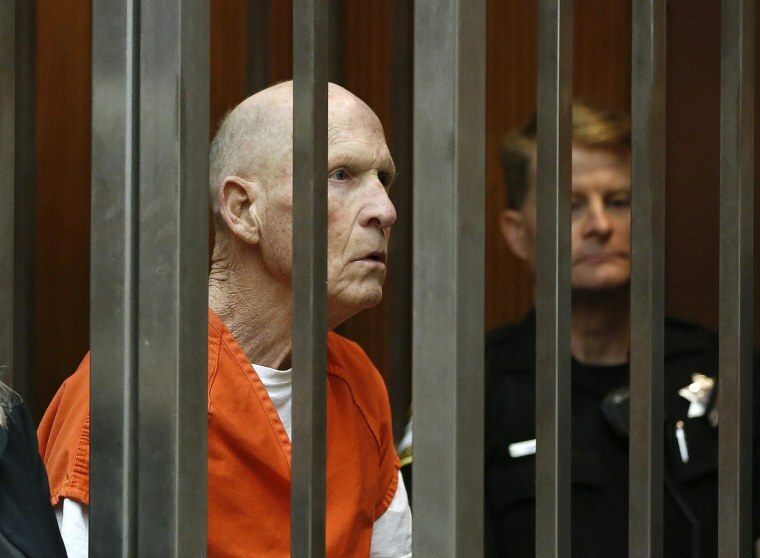 SACRAMENTO, Calif. — California prosecutors announced Wednesday they will seek the death penalty if they convict the man suspected of being the notorious "Golden State Killer" who eluded capture for decades. The move comes less than a month after Gov. Gavin Newsom announced a moratorium on executing any of the 737 inmates on the nation's largest death row. Newsom's reprieve lasts only so long as he is governor and does not prevent prosecutors from seeking nor judges and juries from imposing death sentences. Prosecutors from four counties briefly announced their decision during a short court hearing for Joseph DeAngelo. He was arrested a year ago based on DNA evidence linking him to at least 13 murders and more than 50 rapes across California in the 1970s and '80s. His attorney, public defender Diane Howard, criticized seeking the death penalty against a 73-year-old man, saying in an email that the decision "does not further justice and is wasteful." Prosecutors wouldn't comment after the hearing, but Orange County District Attorney Todd Spitzer said several prosecutors and family members of murder victims planned a Thursday news conference to denounce Newsom's moratorium. An announcement from Spitzer's office said victims' families "will share their stories of losing their loved ones and how the governor's moratorium has devastated their pursuit of justice." "These are horrific crimes. Our sympathies are with the victims and families who have suffered at the hands of the Golden State Killer," Newsom spokesman Brian Ferguson said in a statement acknowledging that the governor's executive order does not affect the ability of local prosecutors to make charging decisions. California has not executed anyone since 2006, but Newsom said he acted last month because 25 inmates have exhausted their appeals and court challenges to the state's new lethal injection process are potentially nearing their end. He endorsed a repeal of capital punishment but said he could not in good conscious allow executions to resume in the meantime knowing that some innocent inmates could die. He also said he is exploring ways to commute death sentences, which would permanently end the chance of executions, though he cannot act without permission from the state Supreme Court in many cases. "The death penalty does serve as a deterrent," Ron Harrington, older brother of Golden State Killer victim Patrick Harrington, said after witnessing Wednesday's announcement. "Unfortunately now our governor has decided to interpose his own personal opinion regarding the death penalty." Newsom's announcement "places decisions that local prosecutors make in a different light," said Death Penalty Information Center executive director Robert Dunham, whose organization has been critical of how the penalty is administered. Decisions should be made on the facts "and not on their perception of gaining political points by opposing the governor." Criminal Justice Legal Foundation legal director Kent Scheidegger said prosecutors' decision made sense despite Newsom's moratorium. "It's a perfect example of a killer for whom anything less would not be justice," said Scheidegger, who is fighting in court to resume executions. "I think it's entirely appropriate for DAs to continue seeking the death penalty in appropriate cases, because the actual execution will be well down the road and the governor's reprieve won't be in effect by then. Something else will have happened."